As a composer, Nicholas Wilton is best known for his sacred choral music which he began writing in the late 1980s, having previously composed mainly for the piano. As with his sacred choral music, these pieces show the influences of composers whom he most admired at the time; principally Chopin, but also Scarlatti, Strauss, Mozart, Beethoven, Shostakovitch and Liszt. Whilst these pieces are very much his own, he was never shy of paying tribute to the masters from whom he had learned his craft. 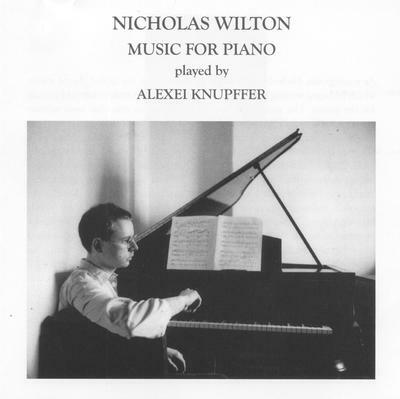 Following a concert in London of Alexei Knupffer playing mainly his own compositions for piano, Nicholas Wilton asked him if he might be prepared to record these pieces. This is the result: a delightful recording of piano miniatures to entertain, charm and delight. A young composer based in England, Nicholas Wilton has previously achieved success with his disc of sacred choral music (see http://www.catholicmusic.co.uk/index.html). His music is deceptively simple. Here, in a disc dedicated to his mother and father, are eight short pieces (the playing time above is correct). The accompanying commentary to the disc states modestly that this is a "short recording of a few miniatures for piano for those who might like them". The miniatures are impeccably championed by the evidently highly musical pianist, Alexei Knupffer. The program note also openly acknowledges that Wilton wears his major influences on his sleeve, and such is the case. Chopin and Scarlatti cast the longest shadows, while Shostakovich, Beethoven and Liszt lurk in the background (sometimes in the far background). The short recital begins with the D-Minor Toccata, where it is surely Scarlatti that feeds the compositional hand (both texture and gesture point to this). The melancholy Spanish Dance in A (perhaps pointing towards Albéniz) is geographically specific in demeanour but more, it holds a key to Wilton's methodology: that of a Satie-esque way of making the most of ostensibly simple gestures. The Waltzes speak most strongly of the influence of Chopin (the second, the F-Minor, in particular, to my ears, and the Fourth, in a hyper-melancholy C-Minor: though the ending of the latter piece, a question mark in music, points more towards the enigmantic Satie again). The Waltzes speak, also, of a gentle soul at work here, but a soul that is entirely unafraid to speak its own truth. Accusations of being derivative are inevitable, perhaps, but careful listening reveals deeper truths. The charming innocence of the opening of the third Waltz (G-Minor) is perhaps allied to the technique of emotional Rückblick that one encounters in Schumann's Kinderszenen, and even as Wilton's Waltz opens out emotionally, it remains overshadowed by its opening. The only Waltz to demonstrate any real sort of assertiveness, and then briefly, is the Fifth (A flat-Minor). The final B-Minor rides the tightrope of playful and melancholy with consummate expertise, ending with a firm gesture; yet, nevertheless, we are left wanting more. As refined audiences throughout the world show ever-increasing fondness for Nicholas Wilton's sacred polyphony-an area in which the composer is revered as a living master-the recent release of Nicholas Wilton: Music for Piano, reminds us that he is also at home in the world of secular piano composition. This breath-of-fresh-air release gives us music that rises to the starry heights of classic English composition, but on wings possessed by very few, to speak of Mr. Wilton's loving apprenticeship to the past and his magisterial sense of beauty. To insure the success of the collection's "eight delightful miniatures," the composer has chosen no less than fellow composer Alexei Knupffer, London's fashionable virtuoso pianist, to bring them to palpitating life. On hearing the CD for the first time, this author can attest that few decisions in today's recording industry could be happier than this collaboration of two of London's best and brightest. Musically speaking, the result is truly smart in that wonderfully British sense of the word signifying not only "correct," "clean," and "neat," but reliably and even charmingly so. In addition to Wilton's absolute mastery of form in the six waltzes, there is an extra dimension of intellective finesse and transcendent emotion. These so-called miniatures contain a breadth and depth of thought making them psychologically large and memorable works. Listeners will quickly realize that this is no mere doffing of the hat to the introspective composer of the Hôtel Lambert. For, Nicholas Wilton has done what all the great composers of his nation have always done: refine their French models. Handel's opera overtures have the same relationship to Lully as Wilton's waltzes have to Chopin. Remarkably, however, Mr. Wilton has demonstrated that the purest form of the valse romantique remains functional and relevant in our twenty-first century world. Meanwhile, Mr. Knupffer knows exactly how to balance the underlying musical origins of the waltzes with their soaring originality. Knupffer's unique interpretive gifts allow every note, every transition, the contours of every phrase, to sing as naturally as a bird flies or a flower opens to the sun. Alexei Knupffer fans will consider the CD an essential purchase. A veritable modern toccata opens the collection with a surprising, almost frenetic energy. Once again, Mr. Kupffer's infallible good taste allows us to appreciate the beauty of virtuosic restraint together with the perfection of Mr. Wilton's immortal craftsmanship. Even more than the welcome delight to the ears that it is, this haunting release is also a delectation for the mind as listeners are challenged to accept the reality that classic principles of traditional composition have triumphed yet again-this time in surprisingly fresh, new ways-over the obsolescent modernism of the previous century. Listeners will demand to hear more of this promising collaboration in future. What do you want to know about Music for Piano by Nicholas Wilton?